THE SIARGAO EXPERIENCE, SURFISTA TRAVELS STYLE! The day before my flight to Siargao, I spent an entire afternoon at work deciding how I would write my out-of-office email message. I considerately decided that Thank you for your email, I will be out of office to go surfing on a beautiful island for six glorious days and do awesome things that awesome people do on an awesome vacation with my fellow Surfistas would be a ruthless thing to send to anyone who would read it while they’re at work. I leaned towards simplicity and just wrote that I’ll be out of office and will respond to their mail when I get back. Dreaming of Siargao even before getting there! By midnight, sheer excitement has prompted me that I will not get any sleep. I’ve already checked my bags twice. I’ve went over my Surfista goodies and tried to fit all the shirts, accessories and baller bands to pass time. Hmmm… maybe I’ll just drink one of those hot chocolate freebies while I do swimsuit inventory. Our Surfista group for August 2013 and our local instructors – who are also the best surfers in the country! The major element of the Surfista Siargao trip would definitely be the everyday surf. That’s good vibes on a daily basis! And if that’s not cool enough, we got partnered with super-skilled instructors who were as pleasant to surf with as they are to watch while they do surf tricks. (Note to self: Learn the specific names of those surf tricks so I wouldn’t be mentioning “tricks” repeatedly!) They were also such warm and fun people who were so helpful in sharing their expertise. It feels so unreal to have surfed at Siargao with those legends. with my instructor Eloy – big wave surfer, boat man, kinilaw chef, super awesome surf instructor and all around nice guy! We’ve also explored other nearby surf spots and it was a quite an excitement. But I’d say it was pretty intimidating, too. For someone who just started surfing early this year, I’ve never really had that much experience on varying waves. Add to that the fact that I’ve never surfed on a reef break before. (Thank goodness for reef shoes!) There were spots where the waves are bigger than what I am used to. Frankly, I think I grew solid guts because of this entire surf experience. ROCK POOLS, CARABAO RIDES, ISLAND HOPPING. Siargao is well-known for surfing but there are other cool things to do there. One of our sunny mornings was spent jumping off rocks and dipping in the clear waters at Magpupungko Rock Pools. That one’s rather memorable because I somehow confounded my height fright that day. Awesome feeling. Siargao is beautiful and there are so many places to visit! We also had a free day so we decided to use up a couple of hours to go carabao-riding. Chelle, one of the Surfistas, and I decided to add a dash of fun by wearing our dresses to this happy occasion. If you’re gonna do it, do it with flair, right? I consider this one of the many amusing highlights of the trip. Kevin riding the carabao like a boss! Freshly grilled seafood, mangoes and banana, rice for our simple island hopping lunch – it was SO GOOD. More tropical fruits for dessert – watermelon for a hot hot day. Of course we had to have that jump shot in Guyam Island. JUNGLE JUICE, STARGAZING, GAME NIGHTS. I’m just so glad to have met people who were as ready as I was for whatever the island had to give. The very first night at the place, we heard about Jungle Disco (aka Jangol Deesco). It wasn’t part of the trip’s itinerary but we were so game for the island life and we were ready to roll! So what if we haven’t slept the night before? We excitedly waited for midnight and went to the disco! I actually pictured it to be in the middle of the jungle because it was called Jungle Disco, right? But no, it’s not literally on a jungle, but yes, there was dancing. And the finest part — Jungle Juice — the yummy drink that established the birth of our group’s name the Nutty Jangol Juice Surfistas. Some nights we spent looking up at the sky and watching countless stars. It was beautiful and that’s definitely something you can’t do in the city. On starless nights because of rain, our group always found a way to do something fun and hilarious. We had game nights and some nights were just spent talking — one minute were talking about our odd future plans (keyword: mermaid), next minute we were discussing books and another minute were singing Saging lang ang may Puso remix version. We were nuts! The skies were dark on the day we were leaving. All of us Surfistas were just silently sitting on Siargao Airport’s waiting area, bracing ourselves for our normal city lives. We were waiting for quite a while when someone announced that our flights got cancelled because of the weather. We all looked at each other, wordless, emotionless. (Another version of this story is that there was a resounding YAY heard in the entire airport but this has yet to be confirmed). There was so much work to do in the city but who are we to fight the forces of nature, right?? ;) Maybe the island wasn’t ready to see us leave. One of our extra days was spent going to Sohoton to check out the caves and lagoons. It took hours to get there but the view, the encounter with stingless jellyfish, the caving experience and the chance to jump off a cliff again were definitely worth the time. The rest of the days were dedicated to added crazy talks, even more food and of course, more surf time. On the whole, I can absolutely say that the SURFISTA SIARGAO trip I signed up for falls under the Awesome Surf Trip category. Every aspect of the surf experience was terrific, the other activities were fun, the people I’ve met were amazing, the resort (Kermit Surf & Dive Resort, check them out!) and the folks there were so cool and Elaine did a lot of awesome work to make sure that our trip goes smoothly. I would definitely do it again. Definitely. I would totally go back. I’ll never forget this Surfista in Siargao experience!! JJ is coming with Surfista Travels to Siargao this August! Thinking of taking a crack at SURFING? This sport is continuing to grow around the world and for folks who are looking into beginning an affair with surfing, it’s worthwhile to explore its pros and cons. You will surely find plenty of reasons to go surfing. To know how it could benefit you, let’s look at the awesome side of this sport. Surfing is a GREAT workout. Fact: Surfers, especially the long-time ones, have flash-worthy bodies and it’s no wonder. From paddling out to the ocean, to popping up, to riding a wave, surfing works out different areas of your body. You exercise your arms, shoulders and back when paddling. You utilize your core and upper body when you pop up on your surfboard. And when you’re already standing, your leg strength and sense of balance keeps you up. So get ready to be fit because there are heaps of physical benefits that surfing could offer. Manette Alcala from Siargao island is a tiny girl but very powerful! The OCEAN is your playground. If you’re my kind and water is your happy place then just the thought of getting to play with Mother Ocean would be reason enough for you to go for a surf. Catching some waves is a good way to just take it easy and enjoy water time. It also takes you closer to nature and in the process, furthers your motivation in protecting the ocean. These surfers from Siargao live right next to the Pacific ocean and they get to play in it almost every single day. Feed your WANDERLUST. Unless you live right by the coast (lucky you! ), you wouldn’t just simply go around the corner and drop by a neighborhood surf spot. You need to go to places where you can surf and the trip would be an adventure in itself. As a city girl, I always look forward to surf trips. Traveling is an enriching experience and a lot of surfers are embracing this truth. As you get so immersed into surfing, you will want to travel a lot to go to wherever there is a wave to catch. Surfing means getting to travel to exotic islands, locations and countries! Catch the STOKE. Surfing not only benefits your body, but also your mind. You hear surfers getting stoked all the time and you wonder what it means. It’s the rush that you get when you catch a wave. It’s the thrill you have when you know you’re being one with the ocean. It’s like fiesta in your head. And to better understand it, you need to experience it yourself. Surfing brings out a different kind of “high” called STOKE – every time you catch a wave! You don’t just do the sport, you live the LIFESTYLE. Surfing doesn’t stop when you get out of the water. It’s the road trip, the meals you have with your friends, the conversation you have about your stoked surf sessions over a couple of beers or dinner. You meet so many different kinds of people from all walks of life from around the world – all united by this lifestyle called surfing! It’s a relaxed and chill lifestyle filled with good vibes that you take that with you even when you go home. Surfing brings an entire new world and lifestyle to your being once you immerse yourself in it. Prepare to have bigger, better, more open world. Are you convinced to go surfing yet? Good. Get ready to pack your bags and go for that surf trip. But to make sure you are completely geared up for it, you should know that surfing, with all the good stuff that it presents, also has another side. As like any other physical activity, there are risks. We all love the ocean but there are dangers out there. Surfboard injuries, drowning, hitting the sandbanks or the reefs and collisions on large crowds are only some of the hazards surfers face. Add to that a bunch of menacing sea creatures (eeek!) that none of us intend to have an encounter with. All these risks, however, are avertable if you come prepared. Take surfing lessons. Your instructors will give you pointers not only on surfing but also water safety. And always be attentive of your surroundings and fellow surfers. Remember to surf only the waves that suit your ability. Best to listen to the locals, they will surely know if it’s alright to go out there or sit some waves out. Boards and bones can possibly get broken in this sport – that’s a fact. But if you’re careful and take the necessary precautions, you can prevent yourself from unnecessary injuries. Surfing ain’t cheap. There’s a price to pay to enjoy this sport. But if you have a strategy, it wouldn’t be that expensive either. If you are to begin surfing, you can’t just show up by the beach and magically know how to surf. You need to take lessons. Good for you if you could score that for free but if you are to spend cash, make sure you hand over your precious money to reputable instructors. You’ll know it’s worth it. Also, because of the travel factor involved, you would need to spend to conquer your next waves. And when you are ready to buy your first surfboard, prepare yourself for some more money-spending. Again, it’s all a matter of creating a good financial arrangement that would suit your surfing fancy. Brand new and custom made surfboards can get pretty expensive. But if you’re just beginning, there are many 2nd hand surfboards for sale out there. Surfers have plenty of sun exposure. When surfing, you’ll be out in the sun for a long time and you are in great risk of getting sun-damaged skin especially your face. Protect yourself by finding the right sunscreen for you. Make sure you put it on properly and frequently. And while on the beach, wear hats and sunnies. Or seek some shade. Make sure that you also look after your eyes and not just your skin. Sun rays could be really harmful but you can always take preventive measures to avoid the damages it could give. Gotta protect your skin and use the proper sunscreen! Our recommended sunscreen: VMV’s Armada Sport. Flat season is a sad season. For most surfers, absence of waves could mean gloom. But it could actually be a good time to learn and get involved with other fun pursuits. It’s a bummer when the waves are flat but you can still get to do other fun things on the ocean. One thing is for sure though, PROS definitely outweigh the cons. ;) Life is short, you have to live your dream and you really won’t get to experience anything new – especially surfing – if you get out of your comfort zone. If you really are itching for some surf action though, how about you make it a quest to go where the waves are? Travel! Take a trip to find the waters that could wash away that gloom. Even more awesome if you let Surfista Travels arrange the trip for you! With the Philippines being surrounded with bodies of water, Surfista Travels could certainly take you to the best places to catch waves. Elaine Abonal and Luke Landrigan guest on Magic 89.9’s Boys Night Out Radio Show! Last February 13, 2013, Surfista Travels Philippines’ Elaine Abonal and Surfista friend and Billabong San Juan Surf School Head Coach Luke Landrigan were guests on one of Manila’s favorite DJ’s and radio shows: Boys Night Out with Tony Bueno, Eric Virata and Sam Gogna. They talked about surfing, the upcoming Billabong All Girls surf camp and predictions of LOVE LIVES & CAREERS! Haha! It was a lot of fun and we were very honored to have been able to be part of the show! Listen and watch this YouTube video of their radio guesting – one of the funniest Surfista Travels has had yet! Elaine Abonal and Luke Landrigan killing time and waiting outside the booth! 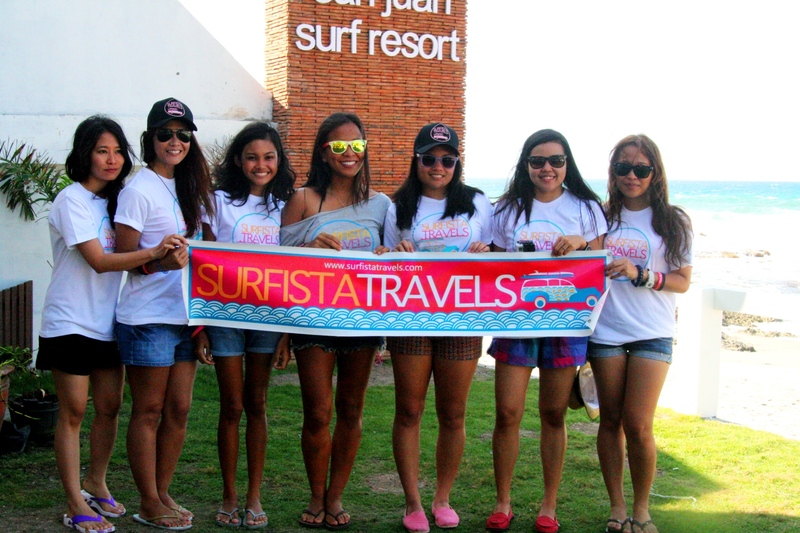 Happy 1st Birthday, Surfista Travels Philippines! 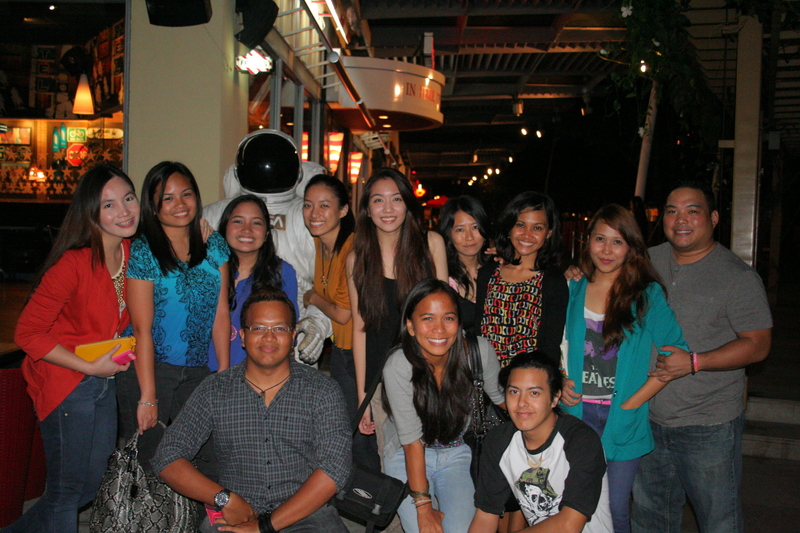 We had a mini reunion and dinner with our fellow Surfistas last February 12, 2013 to celebrate ONE YEAR since we’ve had the first ever Surfista Travels Philippines trip!!! SO MANY people turned up to show their support and see their Surfista friends again. People took photos, talked about their first time surfing, talked about their Surfista trips, caught up, laughed, ate, and just enjoyed each others’ company. 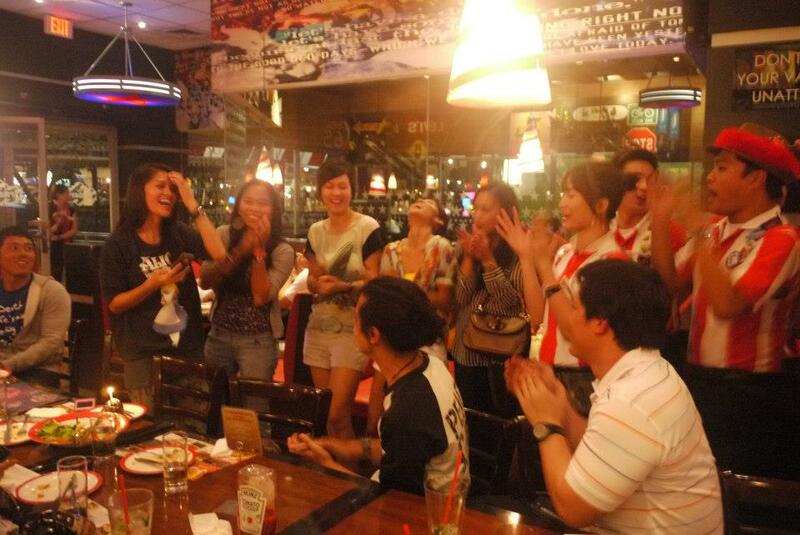 Thanks for coming, Surfista and we hope that this will be the 1st of many more years of Surfista birthdays and reunions!!! Here are some photo highlights from our very 1st Birthday! Want to see MORE photos from our Anniversary Party? Check them out on our FACEBOOK PAGE.